Fantastische plek. Geweldige accommodatie. Het personeel was heel vriendelijk. Echt super leuke tijd gehad hier. 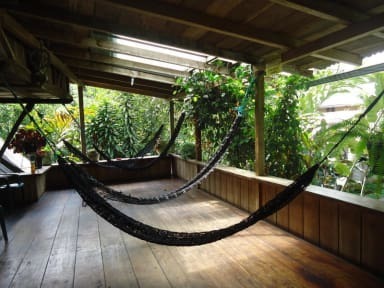 A very decent hostel in mindo, nice and quiet place with a river in the garden kinda. Breakfast is not worth it, in my opinion too expensive for what you get. Beds are good with mosquito nets which you really need in mindo. The town is full of sand flies mostly, still itching haha. I suggest to wear long pants if you are not moving, for example chilling in the garden. I liked the stay here! Nice chilled hostel. Only thing I didn't like was that there weren't any lockers. Other than that nice hostel with nice staff.